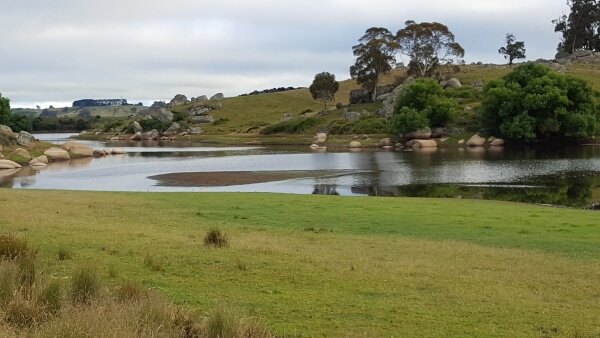 This Easter happened to coincide with my birthday and Karen, Boris and I took our families to stay at a farm house for a little R&R. We stayed at the comfortable Billabong Cottage in Norway near Oberon on the western side of the Blue Mountains, about 3 hours from Sydney (Australia:). We decided to make the trip a bread holiday – not sure if that’s a thing, but it probably should be! Karen was keen to perfect a fruit bread we have been working on. 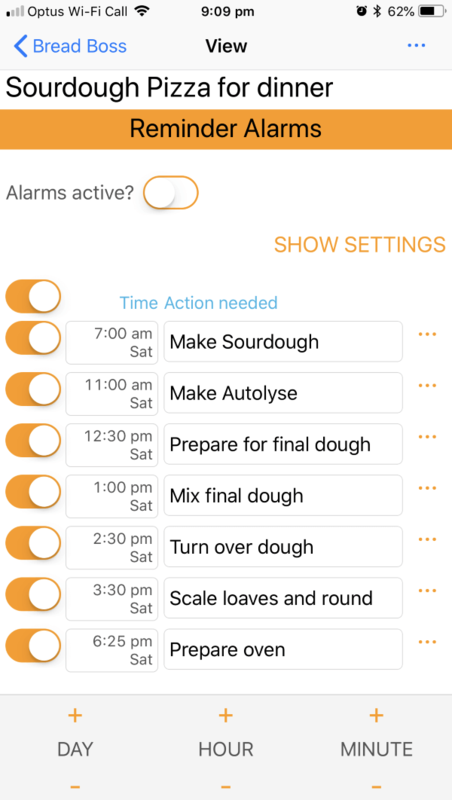 Boris wanted to perfect our freshly milled flour recipe and I … I just wanted sleep. As luck would have it I had to stay awake and work on the sourdough pizza. Oh, and we also decided to make a freshly milled sourdough rye – just to mix it up a bit. 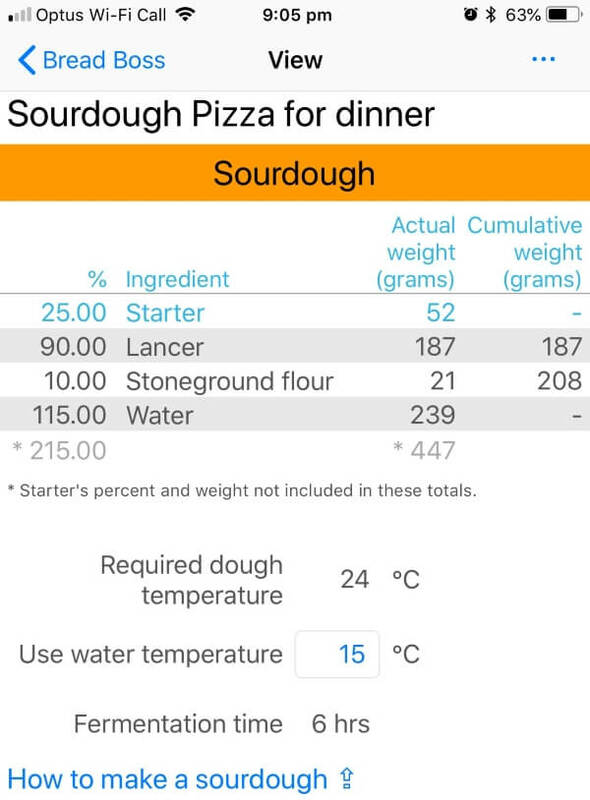 The sourdough pizza was going to be a one day affair. The preparations were simple and worked in with my desire to hang around the farm house and sleep. 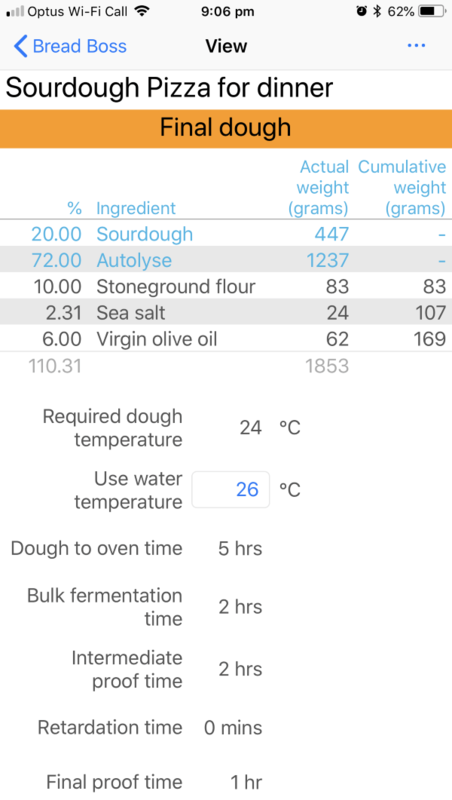 The full Bread Boss recipe I used is at the end of the post. 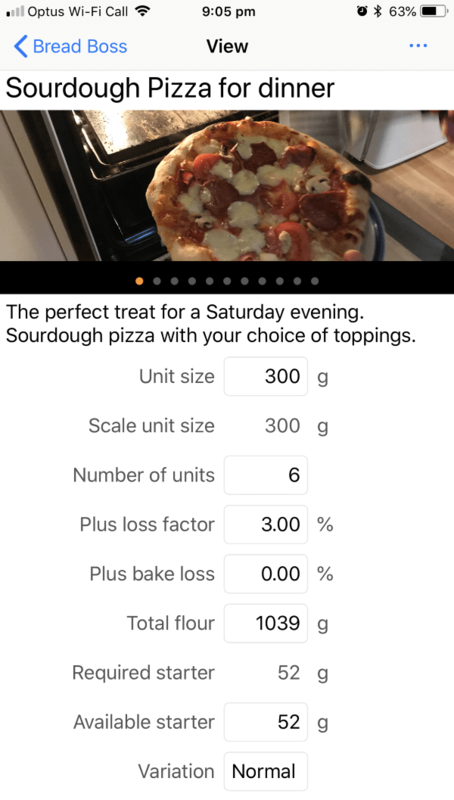 An important point about the recipe is to make sure you have a large enough unit size. I had previously tried a slightly different recipe and only used 200g units. It was really hard for me shape it into a reasonably sized pizza base and I ended up making it too thin and getting holes in it. With a 300g unit it was much easier to get a nice and even base that was thick enough to rise to a perfect pizza base. We brought Steve (my main starter) up with us for the pizza, the fruit bread and for the freshly milled wheat bread. Aurora also came along to be the starter for the freshly milled rye bread. Aurora is Steve‘s daughter and was named after the Aurora Borealis – there has been a recently identified green light stream in the northern hemisphere that is not part of the usual Borealis lights and was officially named Steve – for the same name sake as my starter Steve, and hence I decided to name his daughter Aurora. I made the nice wet sourdough in the morning and by the afternoon it was nicely bubbling away. The flour that we used was the single origin Provenance Lancer flour that we also sell from our site. It’s a fantastic flour that is really easy to develop. You don’t need to be a world championship wrestler to get this flour into shape. 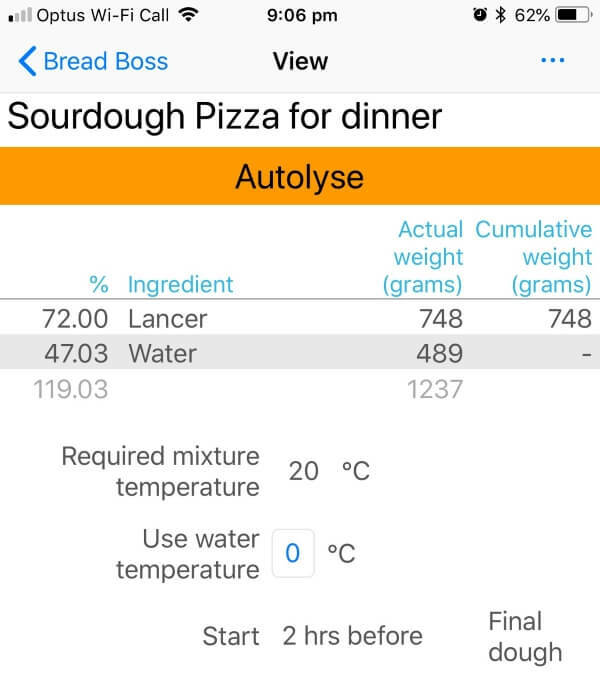 Although there is not much work involved in making the pizza base, you do have to keep track of time and there is nothing like Bread Boss’s reminder alarms to keep you on script for the perfect pizza. Once you finish the final dough and have scaled off the units, you need to put them in a tray or plate with lots of olive oil around them. Make sure you put plenty of oil over each unit so that they don’t join up together in the tray or plate where you store them during the final proof. You can see in this picture the pizza bases on a plate – lots of oil keeps them separate. It is really important that the peel onto which you’ll put the pizza base is heavily dusted with both flour AND semolina. 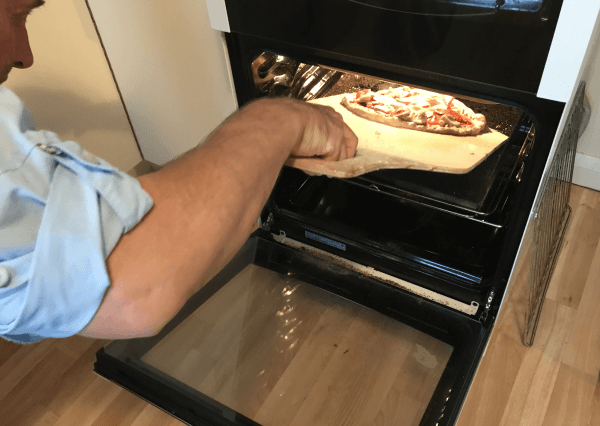 This ensures that the pizza slides off nicely onto the stone in the oven – these act like ball bearings on which the pizza can slide. 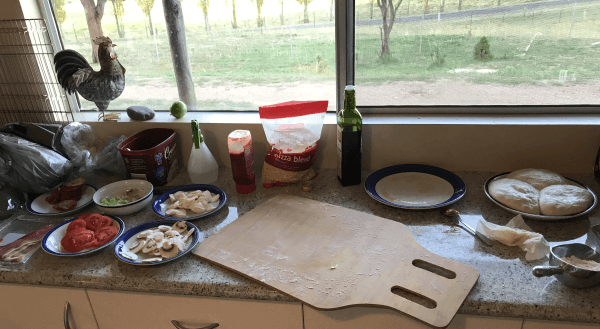 A really good alternative is to use baking paper – you shape the pizza base and place it directly on the flour dusted paper, on the peel and then slide it into the oven (with the paper). The flour is not necessary because the baking paper stops all sticking, however the base tastes nicer with the flour on the base, its up to you of course. 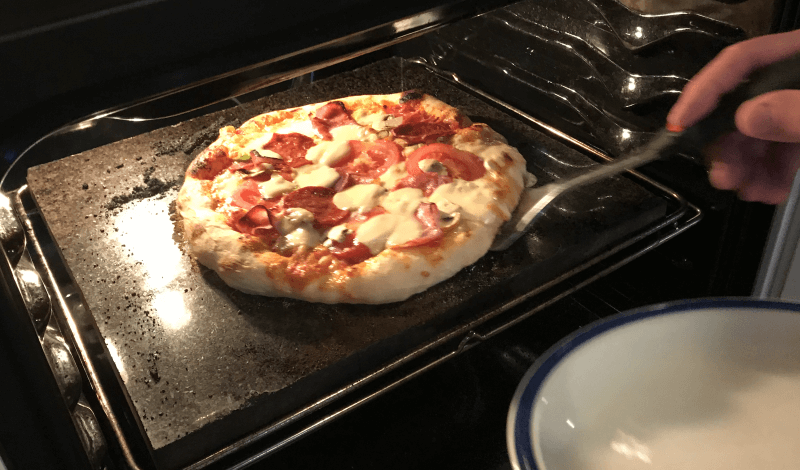 You need to pre-heat your oven at it’s maximum temperature, as pizza needs to bake hot and fast. Probably the most important thing about making pizza is ensuring that you have an oven stone. The stone ensures that you get the heat you need, because as soon as you open your oven to put the pizza in, a lot of heat will escape. The stone provides fantastic thermal mass with low thermal conductivity – so minimal heat escapes when the oven is opened. Also, because of the low conductivity you need to pre-heat for a longer time than normal – I usually pre-heat for 45mins on maximum to get my particular stone piping hot. When you’re ready to make the pizzas, give your peel a good dusting with flour and semolina to prevent the pizza base from sticking to the peel and resulting in a pretty dramatic end to your masterpiece. Again, baking paper for the no fuss method. Lay the pizza base on the peel. Fix any holes as it is very important that you don’t have any tears or holes. 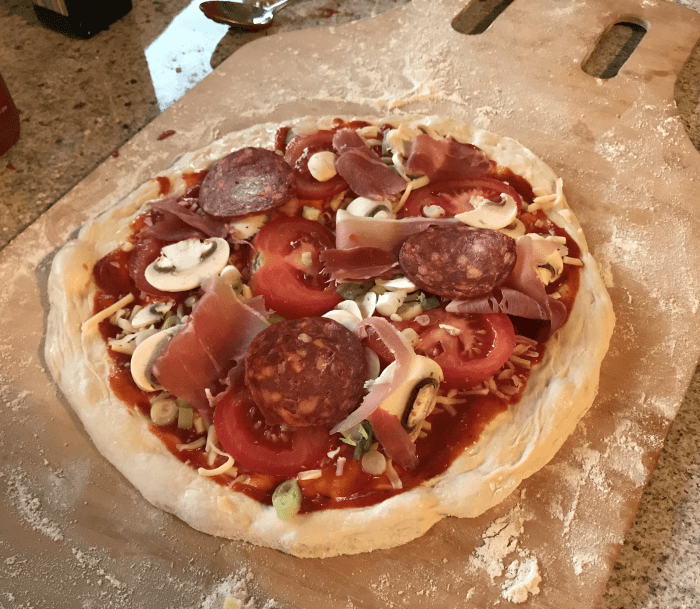 If you don’t fix these then the oil, sauce and toppings will seep through and cause the whole pizza to stick to your peel – again, leading to an ugly end (its not so much of an issue if you use baking paper). 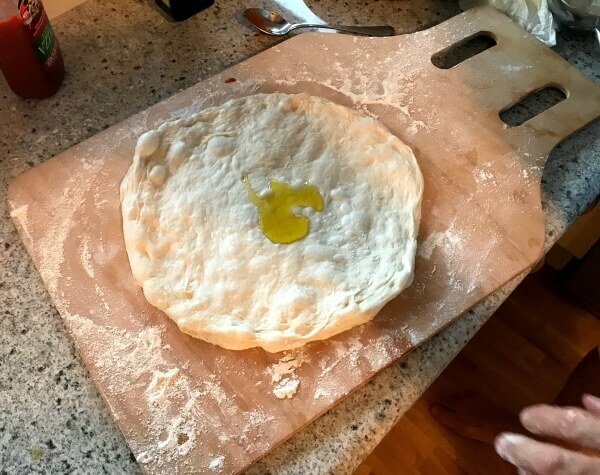 Once laid out on the peel, pour a bit of olive oil in the centre (about 1-2 table spoons) and using the back of a spoon spread the oil evenly over the pizza base. It’s really important that you cover the whole pizza base. 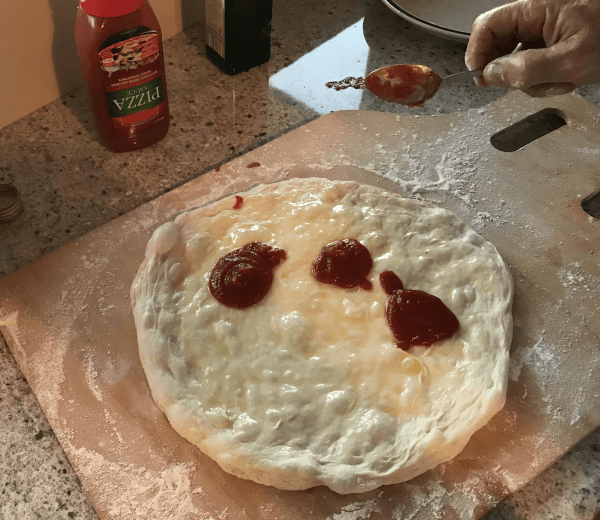 If you don’t then the water in the pizza sauce will make your dough base “soggy” and prevent a nice rise, resulting in a tough leathery base. 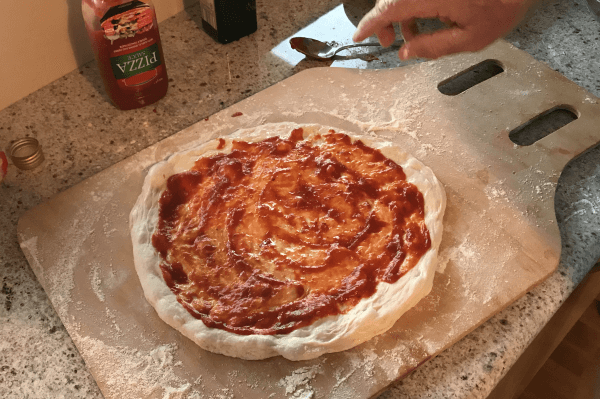 Add the pizza sauce – either squeezed from the bottle or if you have a nice recipe you can make your own sauce. I suggest you use the bottle for your first attempts, just to keep things simple. As with the oil, use the back of a spoon to spread the sauce evenly over the base, making sure you only spread it over the oil. Once you have the oil and sauce in place you are free to be as creative or minimalist as you like. Boris is of the school “less is more”, where as I’m more of a “super-supreme-o” – I love the taste explosion of lots of ingredients. Anyway, this is the part where you let your individuality shine. When you have it all ready, do a quick check to make sure the base is not stuck to the peel. Give the peel a slight jerk to see if it all moves evenly as a whole. If not then get your fingers under the base and throw some more flour and semolina until you are sure you can slide the pizza on the peel. Get it into the oven and on the stone nice and smoothly, starting at the back of the oven, tipping the peel and drawing it back as the pizza slides off. Depending on how hot your oven can get and how thick your stone is, it will take from 5 to 10 minutes to bake. Set a timer by all means, but I recommend just watching it – in this case its not a pot trying to boil, so it will go pretty quickly – for me it was a bit like watching an open fire, you could see it rising then baking and browning nicely. When you see the crust starting to brown, have a quick look by lifting up an edge of the pizza base with a spatula. When it’s nice and golden, use the spatula to slide the pizza onto your plate or whatever you are using. It will be quite strong so will move nicely out the oven. I guess the only down side is that you can only make one at a time in a domestic oven. The best way to enjoy it is to share each pizza as it comes out the oven, each person concocting their own special pizza to share.